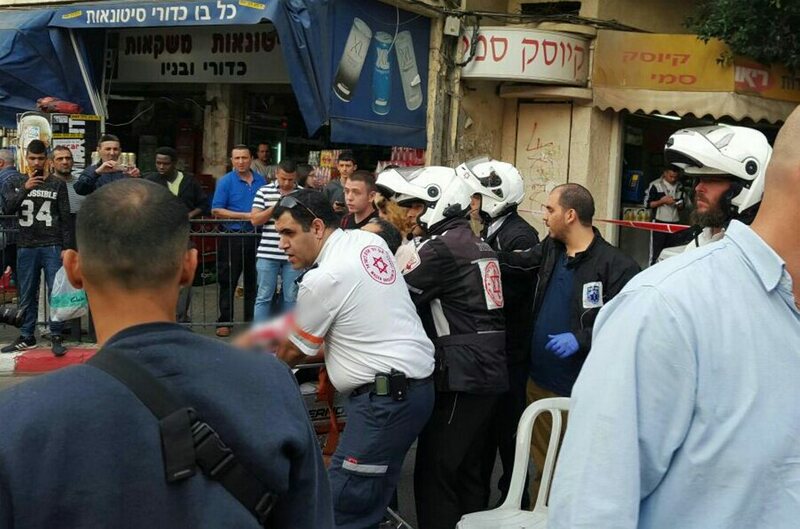 Photo by Magen David Adom Spokesman/Israel Sun 8-3-16 Three terror attacks hit the cities of Jaffa, Jerusalem and Petah Tikvah within an hour and a half on Tuesday afternoon and early evening, with one person murdered and 14 wounded. ????? ?????? ?????/??? ???????? , ??? ???? ???? Three terror attacks hit the cities of Jaffa, Jerusalem and Petah Tikvah within an hour and a half on Tuesday afternoon and early evening, with one person murdered and 14 wounded. An American tourist was killed in the popular tourist district of Jaffa on Tuesday during a violent stabbing attack which left nine others injured in two days of terror across Israel. Taylor Force, a student, was in Israel learning about entrepreneurship when he was fatalled injured by a 21-year old male from the West Bank, who was shot dead during the rampage, leaving five people seriously wounded. Force, who had been studying at the Vanderbilt University in Nashville, Tennessee, is the latest victim in a wave of violence that began in September, and which shows no signs of subsiding, with 29 Israelis and 180 Palestinians having now been killed. The spree may have been timed to coincide with U.S. vice-president Joe Biden’s visit to Israel. Biden was meeting former Israeli president Shimon Peres at the latter’s peace centre nearby. Peres “condemned in the strongest possible terms the brutal attack” on the American, but there were several other attacks on the same day. Hours earlier, two Israeli police officers were injured in Jerusalem’s Old City, one seriously, while a strictly-Orthodox Jew was stabbed in Petah Tikva, near Tel Aviv. On Wednesday, two Palestinian gunmen began shooting on a main road alongside Jerusalem’s light railway, close to the New Gate of Old City, as Biden met Israeli Prime Minister Benjamin Netanyahu as part of the two-day visit. The 20-year old attackers fled in a car and were later shot and killed, as police units identified the vehicle and moved in. Both were from Jerusalem, said police spokeswoman Luba Samri. No Israelis were injuries, but a Palestinian civilian was wounded, and is being treated in hospital. Also on Wednesday, a Palestinian tried to stab Israeli soldiers at a West Bank checkpoint before being shot and killed, the Israeli military said. On Tuesday, two police officers were injured in an attack at the Old City’s Damascus Gate, the site of several similar incidents in recent weeks. Police spokesman Micky Rosenfeld said the assailant gave chase through the streets and wounded another officer before finally being gunned down. Earlier that day, a Palestinian woman in her 50s tried to stab Israeli security forces in the Old City before being shot dead. No Israelis were wounded in that attack. In the Tel Aviv suburb of Petah Tikva, a Palestinian reportedly had his own knife turned on him by a strictly Orthodox man whom he had just attacked, being stabbed and killed by his victim, who was subsequently treated in hospital. Israeli security forces responded by sealing the West Bank home of a Palestinian who killed an Israeli border policeman in a November. Israel says house demolitions act as deterrence, but critics say it amounts to collective punishment. The wave of violence, which some analysts are increasingly referring to as an “intifada,” began in September, following clashes in Jerusalem, after hundreds of religious Jews sought to pray on Temple Mount, Islam’s third-holiest site.